Come on and join me on “The Climb.” Starting today, my Weekday Podcast, Weekday BLOG, Weekly Teaching, and 4forFRIDAY will all be focused on assisting you Discover the Best You. All of these tools are designed to do four things for your new year. Take a fresh look at where you are, where you’ve been, and what you’ve learned. Set a course for where you and the Divine want to go. Simplify the directional maps to move forward daily. To sense a clarity of purpose, achievement, and fulfillment – every day. If you haven’t already listened to today’s PODCAST, CLICK HERE. The text we are focused on today is Psalm 100. Shout with joy to the Lord, all the earth! 2 Worship the Lord with gladness. Come before him, singing with joy. 3 Acknowledge that the Lord is God! He made us, and we are his.We are his people, the sheep of his pasture. 4 Enter his gates with thanksgiving; go into his courts with praise. Give thanks to him and praise his name. 5 For the Lord is good. His unfailing love continues forever, and his faithfulness continues to each generation. I know you are wondering how this Old testament passage could have any meaningful impact on YOUR CLIMB for 2017 – But it does, and here’s how. The best adventures in life include three elements. 1) The Purpose. 2) The Plan. 3) The People. 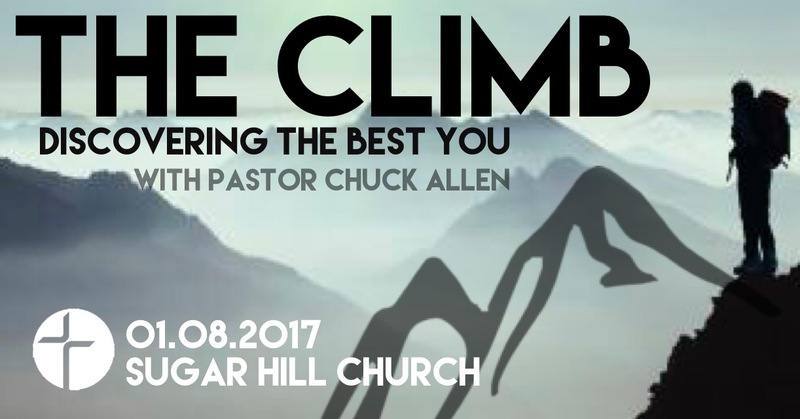 The Climb includes all three and the foundational purpose must include the omnipotent, omniscient, supernatural presence and power of the Divine. You can start a new planner, exercise routine, or goal setting process every year until the end of time and never settle the three essential elements of life at it’s highest level. To start 2017 and finish 2017 having successfully reached the summit in your personal, professional, spiritual, relational or emotional life, we all need these essentials. We need PURPOSE, PEACE, and POWER. Catch this! I believe it to be completely impossible to achieve these three without a foundation that is solidly crafted on God, our Creator, God, our Savior, and God our Sustainer. The Old Testament passage above states the mantra that is essential to our successful climb! “Acknowledge that the Lord is God!” As I spoke on today’s PODCAST, Psalm 100 is a little five verse invitation to journey with the Divine. That passage invites us to get on The Climb with a solid foundation as it calls out to our soul as we Shout triumphantly to the Lord, Serve (Worship) the Lord with gladness, Acknowledge that God is God – and you are not, Come before Him, and Thank Him! This is the simple, successful formula for every morning routine (BTW, I’ll be sampling a powerful morning routine for you on Thursday of this week). Grab 5 minutes today with pen and paper to answer these questions. What comes to mind first as you think about 2017 and what you hope it will look like? Jot a few thoughts down. If you need a little help, I’ll have a copy of my worksheet in tomorrow’s BLOG. Jot down 5-6 things like travel more, lose 20 pounds, save $1200, read through the Bible. Go with first thoughts and don’t get all super spiritual. Nobody cares about how well it sounds. You’ll probably be the only person reading it. Which areas of your life do you most want to change as you start your CLIMB, and most importantly, which areas do you most want to change permanently? Focus on not less than three, but not more than five. This one is brutal but necessary. What are you afraid of? Fear can hold us back from making what matters happen. Get gut level honest with yourself. Your fears do not define who you are. Go ahead – Name them, tame them and bury them! That’s probably more than you can tackle today. It’s step one on The Climb. I’m so glad you are on The Climb with me. Let’s do this!